Trinity Rose has a gift, a disturbing gift which means she can see things before they happen, terrible things. When she was seven she saw her dog die two days before it happened, but her Gran told her to keep it quiet, not to say anything or tell anyone about her gift. When her Gran dies and Trinity is moved back to New Orleans to live with an Aunt she barely knows and attend school, which she never has before, she is determined to make sure everything is normal. However when the prettiest, meanest girl at school disappears Trinity knows theres something not right, Jessica is in trouble, Trinity knows it because she’s seen it but can she help Jessica before its too late? Having been intrigued by the blurb and cover for Shattered Dreams for a while now I was overjoyed when a copy of it and its sequel, Broken Illusions, arrived on my doorstep. I got a couple of books out of the way first but then jumped into this one and whilst it wasn’t the best book I’ve read all year I still just enjoy it a lot. The storyline is brilliant, I loved the idea of Trinity’s powers and a girl going missing is one of the best uses of them. I thought the way it all mapped out was really well done and the pacing was really good. I didn’t like the ending so much and would have preferred for someone else to be the bed guy but I can live with what happened and it hasn’t put me off reading the second one. I read the book in about three sittings from a Monday night to Tuesday night, with work in the middle, so its obvious that it was a fast read for me. However the narrative is told from Trinity’s point of view and occasionally it got confusing, with sections that I had to go over multiple times just to understand what was going on. It felt like the scene shifted loads just in a matter of words and I often didn’t pick that up, for example I would think characters were stood in a driveway looking at a house but then the car they were in would be mentioned. It was a bit off putting and at those times I would have to go back and read the last few paragraphs again. Saying that though the disjointed narrative allowed for the suspense and overall creepiness of the book to grow and I actually really enjoyed how scary this book was in places. There are terrible visions described that Trinity has and they feel so real that I was waiting with baited breath to find out what happened next. I thought that was a major plus point of the book because it was creepy without being too supernatural and I really cant wait for Trinity to find out more about her parents, especially her mother, and these visions. The characters aren’t anything special. I think the intrigue of what was going on with the storyline and with Trinity’s gift and her parents kept me going rather than Trinity herself. She seems quite sheltered which is understandable having lived in the mountains and never going to school for all her life. However at the same time she seemed quite angry and motivated and full on which jarred a little with me. I didn’t like Chase and thought there was something going on with him the entire way through the book, he just didn’t seem trustworthy at all. The other teenage characters were kinda blended into the background but some of them were very unlikable; Amber and Dylan in particular, but I really liked Pitre and couldn’t help but wonder what was going on with him. Even with the down points of this book it was still an ok read for me. I think if you like crime type novels with a bit of romance and supernatural elements then it will probably be for you, however if you want a simple straight forward narrative then maybe give it a miss. 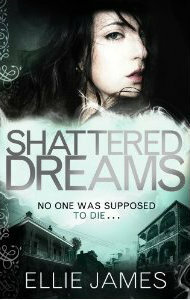 Shattered Dreams is the first in The Midnight Dragonfly series and was published by Quercus on July 5th. My copy was sent in exchange for an honest review.